Nicolas George Hayeki (19 February 1928, Beirut – 28 June 2010, Biel/Bienne), was a Swiss-Lebanese American entrepreneur, co-founder, CEO and Chairman of the Board of the Swatch Group, with principal headquarters in Biel/Bienne. Hayek was born, the second of three children, to a Lebanese mother and a Lebanese-American father, both from well-regarded Greek Orthodox Christian Lebanese families with deep roots in Lebanon's Northern Governorate of El-Koura. His father was trained as a dentist at Loyola University Chicago. His older sister Mona is the widow of the renowned Lebanese architect Joseph Philippe Karam. His younger brother Sam, also a Swiss citizen, is a former CEO of the Swiss group Sibra (Biere Cardinal). In Beirut in 1950, Hayek met a young Swiss au pair, Marianne Mezger, daughter of the industrialist Eduard Mezger. They married in 1951 and moved to Switzerland. They had two children, Nayla and G. Nicolas (Nick) Jr. In 1964, the family moved to Meisterschwanden, a village 35 kilometers west of Zürich. Hayek lived there for the rest of his life. Hayek was awarded the title of Doctor honoris causa of Law and Economics of the Faculty of Beni Culturali of the University of Bologna (Italy) in June 1998, after being awarded doctor honoris causa of Law and Economics of the University of Neuchatel (Switzerland) in 1996. In 2010, Hayek was ranked the world's 232nd richest person with an estimated net worth of $3.9 billion. Hayek died unexpectedly on 28 June 2010 of cardiac arrest during work at the Swatch Group headquarters in Biel. Hayek started his business career working as an actuary for a Swiss reinsurance company. He then assumed briefly the management of the engineering firm owned by his then ailing father-in-law, Eduard Mezger. He soon relinquished this position to search for an opportunity "to learn something new every day". In 1963, Hayek founded his own management consulting firm, the Zurich-based Hayek Engineering. Hayek made his mark quickly on the Swiss and European business scene by consulting and effecting successful turnarounds at several of the largest European multinationals. One of his management credos was: "The rarest resources are entrepreneurial types in top management." By 1979, Hayek Engineering had over 300 clients in 30 countries. Hayek was Chairman of the Board and CEO of Hayek Engineering from its founding until his death. In the early 1980s, Hayek was asked by a group of Swiss bankers to oversee a liquidation of ASUAG and SSIH, two Swiss watch-making firms which were in turmoil due to heavy competition from Japanese watch manufacturers such as Seiko and Citizen Watch. Hayek believed that the Swiss watch manufacturing industry could remain competitive and that ASUAG/SSIH could recover after a restructuring of operations and a repositioning of the different brands. 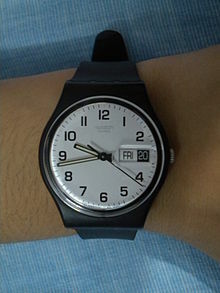 The restructuring of the companies coincided with the invention of the Swatch watch which used far fewer parts than traditional watches thus was cheaper to manufacture. The Swatch watch helped the Swiss watch industry reconquer a large share of the lower end of the watch market which it had lost to Japanese makers. Although the colorful plastic watch became quickly known for its flamboyant marketing, Hayek always emphasized that the Swatch watch was first and foremost a technological breakthrough. Having spearheaded the reorganization of ASUAG and SSIH for more than four years, finally bringing about their merger, Hayek, with a group of Swiss investors, took over a majority shareholding in the new group in 1985. He became Chairman of the Board of Directors and Chief Executive Officer in 1986. The merged company was initially named Société Suisse de Microélectronique et d'Horlogerie, or SMH. It later changed its name to Swatch Group. Hayek played a decisive role in the recovery of the Swatch Group with its watch brands Swatch, Blancpain, Omega, Longines, Rado, Tissot, Certina, Mido, Hamilton, Pierre Balmain, Calvin Klein, Flik Flak, Breguet and Lanco. The strategies he developed in the early 1980s led to the success of the entire Swiss watch industry and regained its leading position worldwide since 1984. Hayek is also credited with having a fundamental role in the creation of the Smart Car, a small European car created for inner city use by Mercedes Benz. Original names for the car revolved around the Swatch name — and even today aspects of the car such as its interchangeable body panels are clearly linked with the Swatch philosophy. The name "Smart" was derived by adding the first letters of Swatch and Mercedes to the word "art". In 1995, Hayek's daughter, Nayla Hayek joined the Board of Directors of the Swatch Group and in early 2010, she became co-Vice-Chairman of the Board. In 2003, his son, Nick Hayek, Jr. became the CEO of the Swatch Group. Hayek remained Chairman of the Board of the Swatch Group until his death. On 30 June 2010, two days after his death, the Board elected Nayla to replace him as Chairman. ^ "Er starb am Schreibtisch". tagesanzeiger.ch. 28 June 2013. Retrieved 6 August 2013. ^ "Joseph Philippe Karam". Retrieved 6 August 2013. ^ "La longue agonie de la brasserie Cardinal prend fin". bilan.ch. 28 July 2011. Retrieved 6 August 2013. ^ "The World's Billionaires". Forbes.com. 3 October 2010. Retrieved 6 August 2013. ^ "Nicolas G. Hayek 1928–2010". swatchgroup.com. ^ "Das Unternehmen". hayek-group.com. Retrieved 6 August 2013. ^ "Nick Hayek". swatchgroup.com. Retrieved 6 August 2013. ^ "Message and Muscle: An Interview with Swatch Titan Nicolas Hayek". Harvard Business Review. March 1993. Retrieved 6 August 2013. ^ "Time Bandit: Nicolas Hayek, CEO of Swatch Group". WSJ. Magazine. 10 June 2010. Retrieved 6 August 2013. ^ "Nicolas Hayek". TSR. 12 July 1988. Retrieved 6 August 2013. ^ "CBC Venture Hayek Interview Part 1". YouTube. ^ "CBC Venture Hayek Interview Part 2". YouTube. ^ "ForumTalks: Nicolas G. Hayek et l'internationale des entrepreneurs". YouTube. ^ "Nicolas Hayek". RTS. 27 September 2009. ^ "Décès de Nicolas Hayek: commentaires de Béatrice Jéquier". RTS. This page was last modified on 5 October 2013 at 04:07.